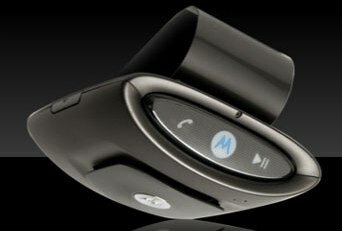 The famous American multinational wireless and broadband communications company, Motorola has recently announced its latest MOTOROKR T505 Bluetooth In-Car Speakerphone and Digital FM Transmitter which features a built-in microphone, 2-watt speaker as well as an integrated digital FM Transmitter. According to the company, the T505 Bluetooth device is designed to allow users to link a compatible Bluetooth-enabled cellphone to their car sound systems and experience the wireless hands-free calling along with their music in the extraordinary car stereo sound, without the need for installation. In addition, this portable and powerful Bluetooth car kit also features StationFinder, the technology which will search the best FM connection that can be found on the user’s car radio and able to mute the music automatically when there is an incoming call and even audibly announces the caller-ID, aiming to help promote safety. Volume, Volume, Volume. It’s your choice – use the powerful internal speaker or get as much volume as you can handle by routing calls and music to your car stereo via the built-in Digital FM transmitter. Take your music everywhere by wirelessly link your music to your car stereo from a compatible Bluetooth stereo enabled phone or music device. Clip-tune-and-go which hooks to the visor and can be taken from car to car. No installation. StationFinder, a breakthrough technology does the work for you – finds and announces the best FM station for a clear FM connection and minimal static. Audio CallerID which users can hear the number of the person calling. Easy Pairing. Exclusive technology simplifies connecting to your Bluetooth devices. Works with compatible Bluetooth enabled music phones, iPods and other MP3 players. Car charger included and long battery life. “Today’s drivers demand convenience and connectivity without missing a beat to what’s important to them — their calls and their music. We’re excited to introduce a portable, music-optimized ROKR to the car to enhance the mobile experience while consumers are on the road,” said Jason Few, corporate vice president, Motorola, Inc. The new MOTOROKR T505 Bluetooth In-Car Speakerphone kit which includes the echo and noise reduction technology is expected to be available in the first quarter 2008 but no words on its price yet.